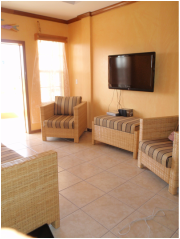 Our modern and elegant 2 & 3 bedroom condominium vacation rentals are just steps from the Caribbean Sea, with breathtaking views of the Belize Barrier Reef, located a short mile from the hustle & bustle of San Pedro Town on the tropical island paradise of Ambergris Caye. Ambergris Lake Villas is your tropical home away from home. Each condominium is equipped with either 2 bedrooms & 2 bathrooms, or 3 bedrooms & 3 bathrooms with full kitchen, dining and living room areas with amazing views of the Caribbean from patios and balconies. Located steps to the Mar de Tumbo beach (one of the best beaches on Ambergris Caye), Ambergris Lake Villas is an ideal choice for families, groups or couples looking for their own piece of paradise. Ideal for your diving or snorkeling vacation.